An energy union between Russia, Kazakhstan, Belarus, and Armenia will be the main focus in the coming year, Russian Prime Minister Dmitry Medvedev said at the inaugural meeting of the Eurasian Governmental Council in Moscow. 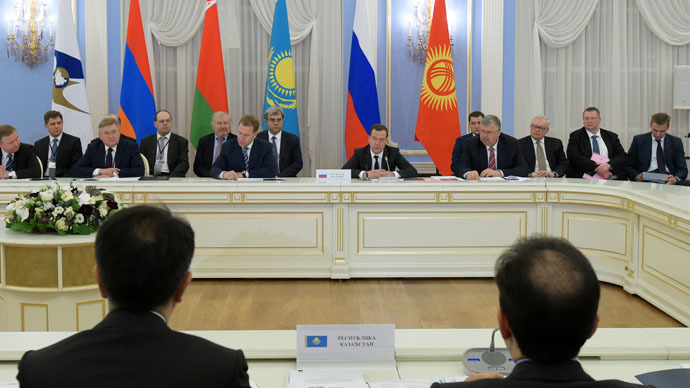 According to Dmitry Medvedev, over 100 agreements will be signed by the Eurasian Economic Union (EEU) in 2015, with an emphasis on developing a common oil and gas market. The largest common market among former Soviet countries is resource rich, and home to 16 percent of the world’s oil, 22 percent of the gas, 7 percent of the coal, 9 percent of the electricity generation, 3 percent of the iron ore, and 4 percent of steel production, according to the group’s website. The estimates only include the three original members - Russia, Belarus, and Kazakhstan. “Key issues will be the implementation of a coherent industrial and agricultural policy, export development and industrial cooperation, starting joint investment projects, developing a common energy market, and service industry, liberalizing cargo shipping, and an open dialogue with the World Trade Organization,” Belarus Prime Minister, Andrey Kobyakov said. In his opening remarks, the Russian Prime Minister conceded that it would be difficult year. “We had hardly overcome the consequences of the 2008 global financial crisis, and now face new challenges with the sharp drop in oil prices and unprecedented international pressure adding to structural problems in our economies," Medvedev said. Another big idea is the removal of trade barriers between member states, which will soon include Kyrgyzstan. An agreement on Kyrgyzstan joining will be ready in the next couple of days, says the head of the Eurasian Economic Commission Viktor Khristenko. Armenia announced in October it was joining when leaders from the Commonwealth of Independent States met in Minsk to formally end the 14-year old Eurasian Economic Community to make way for the EEU. This is the first meeting of leaders since the EEU came into being on January 1, 2015. The Eurasian Economic Union is an economic and political bloc agreed in 2014 to unite Russia, Belarus, Kazakhstan and Armenia. The formation treaty took effect on January 1, 2015. The population of the union is about 171 million people, and its gross domestic product is expected to reach $3 trillion next year.